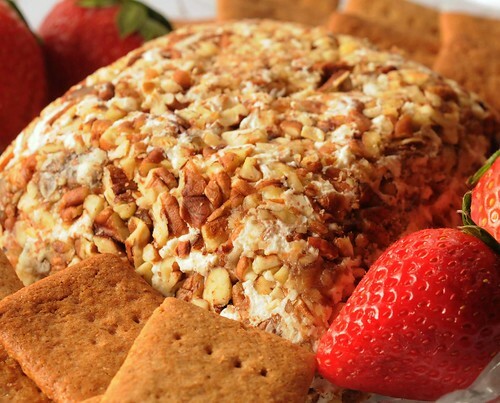 Date Cheese Ball is a slightly sweet cream cheese ball laced with dates and rolled in pecans. No other sugar added. It’s easy, delicious, and a guaranteed hit at your next game night or party. Dates are nature’s little sugar cubes, shaped like a miniature football and apparently soaked in God’s magic elixir. As you will see, dates provide the only sweetness in the recipe. Normally, I don’t eat dates all by themselves. They are just too sweet and sticky. On the other hand, I love chopping and adding them to bread such as my Banana Whole Wheat Yeast Bread. 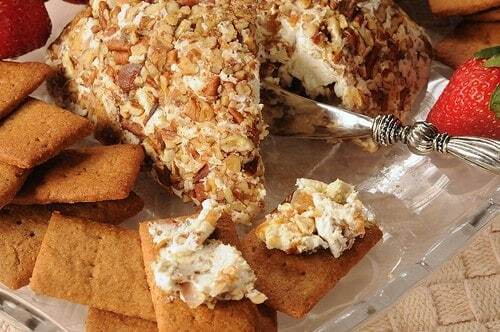 Serve this Cheese Ball with buttery crackers or go all out and make Homemade Graham Crackers. Granted, making graham crackers are a little extra trouble but they are fun to eat and easy to make with my little Ziplock bag trick. Don’t miss it! They make look rather plain and humble. But don’t be fooled. On the contrary, I’m predicting you won’t believe how fresh they taste compared to store-bought crackers. This Date Cheese Ball also benefits when served with fresh fruit. Since there’s not much color to the cheese ball itself, strawberries are at the top of my list. Combine cream cheese, cottage cheese and lemon juice in mixer or food processor until smooth. No one will be able to discern the use of cottage cheese. Promise! Stir in dates. 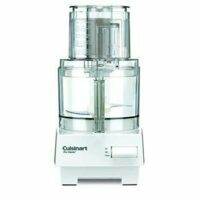 If using food processor, pulse only 5-6 times until mixed. Refrigerate until firm. 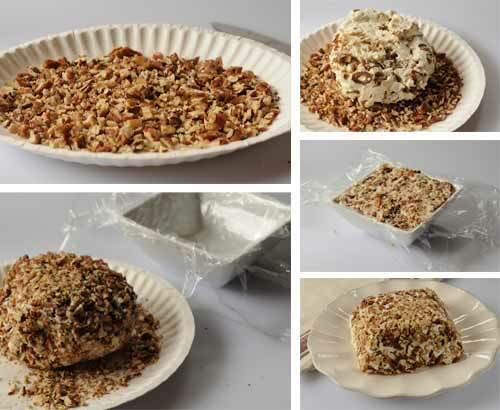 Roll chilled cheese mixture in pecans that have been toasted in the microwave on a paper plate and then chopped for easy cleanup. Make a ball or get creative. Find a cool little dish with an oval or square shape or even a funnel for a cone shape. Line with plastic wrap. Force cheese mixture into shape of bowl. Refrigerate until ready to serve. Just a note, in case anyone else does a search for Carole Walter’s graham cracker recipe, lie I did. I have her book, but wanted to find the recipe online, so I could transfer it onto my online recipe folder. I make these crackers every year for Christmas, dipped in chocolate. When I used your recipe it was way to crumbly. So I checked the book. Her recipe calls for 3/4 cup of butter instead of 1/4 cup. You may have done that on purpose, and maybe it works !! But I just wanted to give a tip in case anyone else was having trouble. That is my mistake. You are correct about 3/4 cup. I also have the recipe listed on this post and it is correct. So sorry Terry. Love these graham crackers. OMG! This morning, while I should be job hunting on line, I stumbled across salad-in-a-jar.com. You are my new favorite person! I have sat here way too long looking at all of your recipes and reading how to make my own yogurt. I just had to let you know how impressed I am. I am a person who loves to cook and everyone wants all get togethers to be at our house so that I have to be the cook. Your recipes are ones I cannot wait to try. We are having a family dinner (we do this once a month to keep family in touch) this weekend and I am making some of your dinner rolls for sure. Thank you for taking the time to share your recipes and tips. I have always wanted to try homemade graham crackers! I whipped these puppies up last week and sprinkled cinnamon sugar on top before baking. My five-year-old graham cracker connoisseur declared, “These are gooder than the store-bought ones, Mama! Yummy!” A million thank-yous for the awesome idea to roll them out in a ziploc bag and freeze before cutting!! What genius. They were super-easy to make. The only trouble I had was getting the dough to form a ball. I needed to add maybe 1/4 c. of water to get it to stick together and not be too floury. Glad the ziploc bag worked for you. I use it for MANY recipes. I note you left this comment almost two years ago but I just figured out why you couldn’t get the dough to form a ball. There was a typo in the recipe, which I have corrected. Instead of 1/4 cup of butter, there should be 3/4 cup of butter. I’m so thankful to the commenter who noticed it. Both recipes sound fabulous! I love dates, and I’ve been on the hunt for a good graham cracker recipe. I like your bold text note about the cottage cheese. I like cottage cheese, but some people are so scared of it! Ok, how many people make their own cheeseballs, turn around and make their own graham crackers? Tell, me, how many? 🙂 (I probably would)! These look incredible – and the dates (I love dates – but not a lot of people I know do)! I am going to make this, of course I have everything in the house except the dates. Those crackers look SO professional (Keebler, watch out)! Kudos to you for all the effort – I can just imagine everything tastes spectaular – and Happy New Year! Happy New Year Paula! 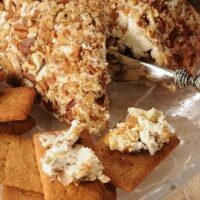 I am going to try these homemade graham crackers – Don will absolutely love them- he doesn’t like things too sweet – and the cheeseball looks wonderful – We’re having a bunch over today and I’m making your blackeyed pea dip – thanks for sharing! The pictures are incredible.